There are a lot of mysteries about the causes of autism spectrum disorder (ASD), including if, how, and when ASD is inherited from parents. We know, for example, that when one identical twin has ASD, the other twin will generally also have ASD, but not always. How can this happen? Scientists know that part of this mystery has to do with how the environment interacts with our genes. Everyone has a genetic code in the form of DNA consisting of approximately 20,000 genes. Those genes are the blueprints for proteins or other molecules in our bodies that act through a process called gene expression. The process, however, is not straightforward. How genes are expressed can be affected by the environment through the epigenome. The epigenome is a biological process where genes and the environment interact. The genes you are born with can’t change in your lifetime, but the epigenome can turn on and off some of those genes. The epigenome provides a way for your cells to respond to environmental changes and change gene activity. It has been called the “ghost in our genes”1 because it controls the activity of the genes with which you are born. 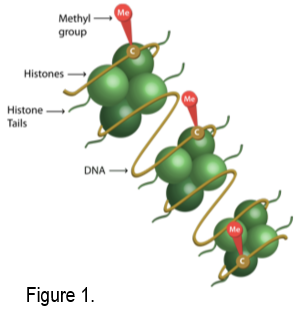 One of the processes that occurs in the epigenome is methyation. Methylation takes place when a methyl group, (a molecule made up of one carbon and three hydrogen atoms), combines with DNA. Adding or subtracting methyl groups to DNA can turn off or on gene activity. In Figure 1, you can see how the methyl group (abbreviated as Me) combines with the DNA (at the cytosine DNA base, abbreviated as C). Advances in technology allow scientists to measure methylation patterns at millions of locations in a DNA sequence to see how those patterns affect the activity of genes. This allows researchers to better understand how certain genes affect brain function and to identify new genes to study in autism. Methylation is involved in how brain cells change shape and function with age and learning.2,3 Environmental factors like chemicals, synthetic toxins, diet, and drugs also change methylation patterns in humans.4-9 We know, too, that methylation patterns are different in the blood of people with ASD.10-12 However, little is known about how environmental factors may change methylation patterns in the brain. Because autism is the result of multiple genetic and environmental factors, and methylation in blood is different than methylation in the brain,13 there is a need for a better understanding of methylation in the autism brain. While great strides have been made, more research is needed to identify potential methylation targets, understand specific gene-environment interactions, and determine whether methylation is a risk factor for autism and/or a consequence of altered brain development. You can be a part of this research. Learn more about the program or research using this resource by signing up at www.takesbrains.org/signup. NOVA. Ghost in Your Genes, http://www.pbs.org/wgbh/nova/genes/. 2007; http://www.pbs.org/wgbh/nova/genes/. Available at. Morris MJ, Monteggia LM. Role of DNA methylation and the DNA methyltransferases in learning and memory. Dialogues Clin Neurosci. 2014;16(3):359-371. Siu MT, Weksberg R. Epigenetics of Autism Spectrum Disorder. Adv Exp Med Biol. 2017;978:63-90. Murphy SK, Adigun A, Huang Z, et al. Gender-specific methylation differences in relation to prenatal exposure to cigarette smoke. Gene. 2012;494(1):36-43. Goodrich JM, Reddy P, Naidoo RN, Asharam K, Batterman S, Dolinoy DC. 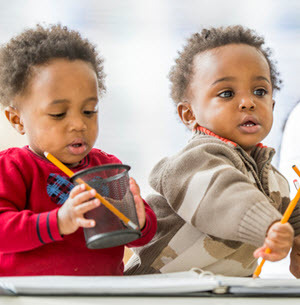 Prenatal exposures and DNA methylation in newborns: a pilot study in Durban, South Africa. Environ Sci Process Impacts. 2016;18(7):908-917. Hoyo C, Murtha AP, Schildkraut JM, et al. Folic acid supplementation before and during pregnancy in the Newborn Epigenetics STudy (NEST). BMC Public Health. 2011;11(1):46. Vidal AC, Semenova V, Darrah T, et al. Maternal cadmium, iron and zinc levels, DNA methylation and birth weight. BMC Pharmacol Toxicol. 2015;16:20. Martin EM, Fry RC. Environmental Influences on the Epigenome: Exposure-Associated DNA Methylation in Human Populations. Annu Rev Public Health. 2018. Cao-Lei L, Veru F, Elgbeili G, Szyf M, Laplante DP, King S. DNA methylation mediates the effect of exposure to prenatal maternal stress on cytokine production in children at age 13(1/2) years: Project Ice Storm. Clin Epigenetics. 2016;8:54. Andrews SV, Ellis SE, Bakulski KM, et al. Cross-tissue integration of genetic and epigenetic data offers insight into autism spectrum disorder. Nature communications. 2017;8(1):1011. Nguyen A, Rauch TA, Pfeifer GP, Hu VW. Global methylation profiling of lymphoblastoid cell lines reveals epigenetic contributions to autism spectrum disorders and a novel autism candidate gene, RORA, whose protein product is reduced in autistic brain. FASEB J. 2010;24(8):3036-3051. Bakulski KM, Halladay A, Hu VW, Mill J, Fallin MD. Epigenetic Research in Neuropsychiatric Disorders: the "Tissue Issue". Curr Behav Neurosci Rep. 2016;3(3):264-274. Ladd-Acosta C, Hansen KD, Briem E, Fallin MD, Kaufmann WE, Feinberg AP. Common DNA methylation alterations in multiple brain regions in autism. Molecular psychiatry. 2014;19(8):862-871. Nardone S, Sams DS, Reuveni E, et al. DNA methylation analysis of the autistic brain reveals multiple dysregulated biological pathways. Transl Psychiatry. 2014;4:e433.